. In the United States, 20 percent of the population exhibits symptoms of allergy or asthma, whereas 55 percent test positive against one or more allergens. Upon initial exposure to a potential allergen, an allergic individual synthesizes antibodies of the IgE class via the typical process of APCs presenting processed antigen to TH cells that stimulate B cells to produce IgE. This class of antibodies also mediates the immune response to parasitic worms. The constant domain of the IgE molecules interact with mast cells embedded in connective tissues. This process primes, or sensitizes, the tissue. 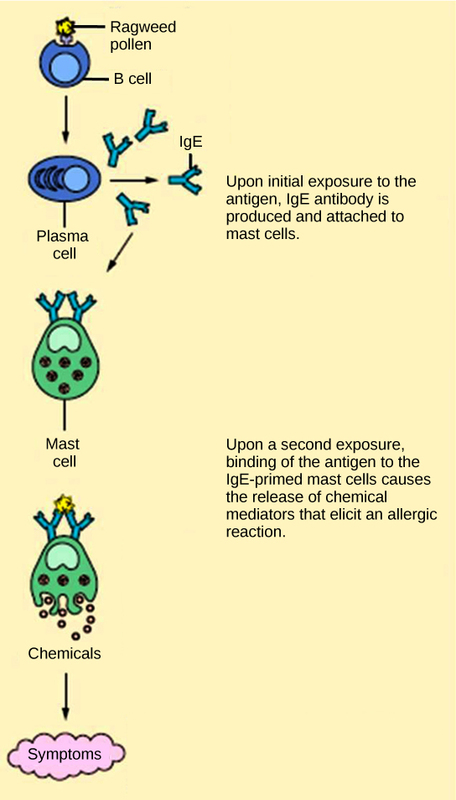 Upon subsequent exposure to the same allergen, IgE molecules on mast cells bind the antigen via their variable domains and stimulate the mast cell to release the modified amino acids histamine and serotonin; these chemical mediators then recruit eosinophils which mediate allergic responses. Figure 23.26 shows an example of an allergic response to ragweed pollen. The effects of an allergic reaction range from mild symptoms like sneezing and itchy, watery eyes to more severe or even life-threatening reactions involving intensely itchy welts or hives, airway contraction with severe respiratory distress, and plummeting blood pressure. This extreme reaction is known as anaphylactic shock. If not treated with epinephrine to counter the blood pressure and breathing effects, this condition can be fatal. Autoimmunity is a type of hypersensitivity to self antigens that affects approximately five percent of the population. Most types of autoimmunity involve the humoral immune response. Antibodies that inappropriately mark self components as foreign are termed autoantibodies. In patients with the autoimmune disease myasthenia gravis, muscle cell receptors that induce contraction in response to acetylcholine are targeted by antibodies. The result is muscle weakness that may include marked difficultly with fine and/or gross motor functions. 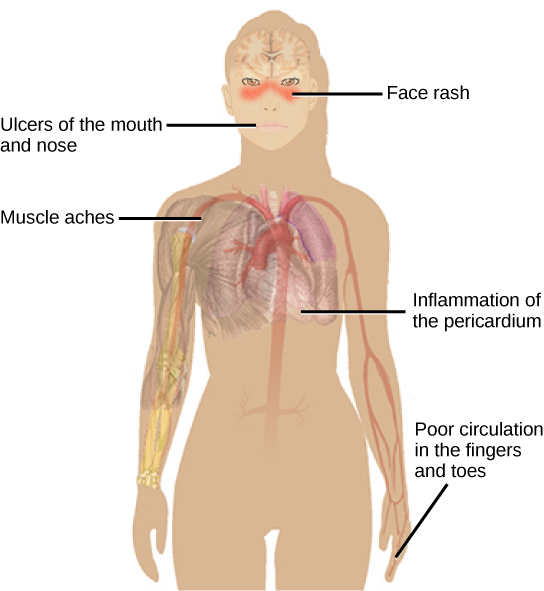 In systemic lupus erythematosus, a diffuse autoantibody response to the individual’s own DNA and proteins results in various systemic diseases. As illustrated in Figure 23.27, systemic lupus erythematosus may affect the heart, joints, lungs, skin, kidneys, central nervous system, or other tissues, causing tissue damage via antibody binding, complement recruitment, lysis, and inflammation. 2. A potential cause of acquired autoimmunity is ________. 4. Which of the following diseases is not due to autoimmunity? 23.4. Disruptions in the Immune System Copyright © by laesoph. All Rights Reserved.